These are exciting times for Doctor Who. As the countdown continues to the Twelfth Doctor’s final adventure—an episode that will also serve as an all-new television adventure for the First Doctor!—the series itself is undergoing a regeneration. Jodie Whittaker has claimed the role of the Thirteenth Doctor! We couldn’t be more proud, and we’re excited to see her take over the TARDIS. 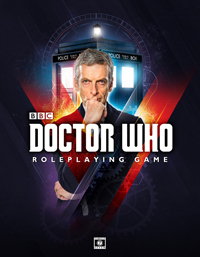 Our Doctor Who roleplaying campaign, like so many others, openly embraces the myriad possibilities embodied by the show’s changeable title character. There is so much potential in the role of the Doctor, and Whittaker will usher in a bold new era for the character. If regeneration stories have taught us anything, it’s that change is necessary, even if it can be hard to accept. Amid the flurry of news regarding this changeover, it’s time to for us to share an update from the game table. Series 10 is at an end, and so is our most recent run of roleplaying adventures. 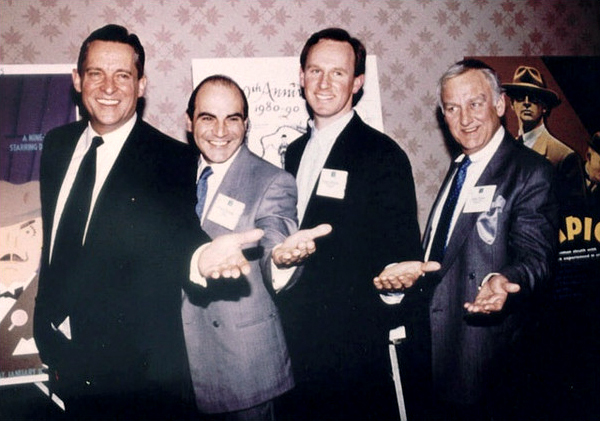 “The Starmind” concluded an unforgettable second series for the Lost Doctor, Jeremy Brett (pictured here with esteemed Doctor Who guest star David Suchet, Fifth Doctor Peter Davison, and John Thaw, each of them a famous TV detective). The Lost Doctor and Riddell braved the elements across frozen tundra, through the depths of teeming alien jungles, and into the roiling cytoplasm of the universe’s largest living amoeba. They faced the Master, the Chelonians, the Ice Warriors, and the enigmatic Viyrans. The series ended with an epic cliffhanger, the revelation that the Cybermen have evolved to vanquish one of the most advanced races in the galaxy! What could possibly happen next? When the Dark Dimension campaign resumes later this week, you’ll find that we’ve jumped a time track. After two series of adventures featuring the Lost Doctor, it’s time to change things up. Our next run of stories will return us to the era of the Nth Doctor, Richard E Grant. We promised you he’d be back! Consider these to be the Nth Doctor’s lost adventures. They’ll break the chronological order of things and take place earlier in the timeline, slotting into the existing chronology for the character. (The episode guide will, of course, be appropriately updated.) Ultimately, our intention is to introduce a unique original Doctor for each of the players in our campaign, and we’ll alternate between them from time to time. This is intended to ensure variety and allow everyone in our game an opportunity to play the Doctor, create a companion, and serve as our game master. So, prepare yourself for all-new adventures in time and space with a familiar hero! The Nth Doctor remains a tormented puppet of the Time Lords, sharing his TARDIS with the ever-inscrutable android Master. We’ll also be introducing a never-before-seen companion who will join in these adventures. 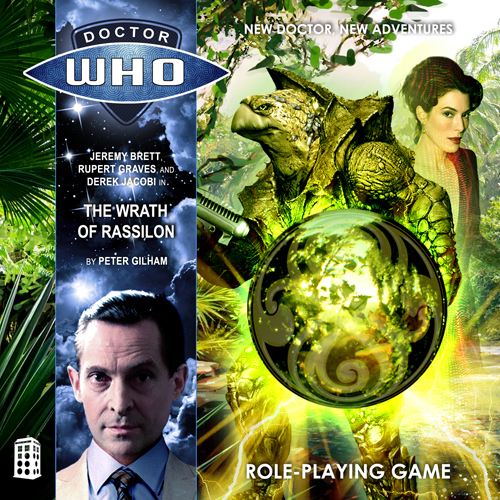 Synopsis: Rassilon: father of Gallifreyan thought and the architect of Time Lord supremacy. Long after passing into the pages of history, he stands as a figure both feared and revered. For those who know of his works, his immortal influence is to be found in even the farthest corners of our universe. The Master and his mercenary minions, the Chelonians, have tracked a lost remnant of Rassilon’s Foundry to the teeming jungles of Arboramorensis. Facing an unassailable army and an inescapable vengeance, the Doctor and Riddell must decipher the ancient riddles of Gallifrey’s All-Father or risk allowing a power beyond imagination to fall into the hands of its most notorious renegade.